On Thursday, U.S. Navy Rear Admiral and longtime White House Doctor Ronny Jackson withdrew his nomination to be the next Veteran's Affairs Secretary after being accused of professional misconduct through media reports. CNN reported earlier this week, on anonymous sourcing, that during an overseas trip in 2015 Jackson got drunk and belligerently banged on a female colleague's hotel door. CNN also reported the Secret Service stopped Jackson and that agents were worried he might wake up President Obama. Turns out, the Secret Service has no record of the incident (bolding is mine). "Over the last 48 hours, media outlets have alleged that U.S. Secret Service personnel were forced to intervene during a Presidential foreign travel assignment in order to prevent disturbing (former) President Barack Obama," The Secret Service released in a statement. "The Secret Service has no such record of any incident; specifically, any incident involving Rear Admiral Ronny Jackson. A thorough review of internal documents related to all Presidential foreign travel that occurred in 2015, in addition to interviews of personnel who were present during foreign travel that occurred during the same time frame, has resulted in no information that would indicate the allegation is accurate." "The physical health and wellbeing of Secret Service personnel when fulfilling our protective mission is of paramount importance to the Secret Service. Rear Admiral Jackson, in his role as the official White House Physician, has provided years of dedicated support to the men and women of the Secret Service, often miles from home and under difficult travel conditions, in order to ensure our personnel are healthy and prepared to execute our critical mission," the statement continues. "The Secret Service is grateful for the dedicated and outstanding professional service Rear Admiral Jackson has provided to the agency - and more importantly -his role supporting the greater residential protection security apparatus." When Jackson withdrew his name from consideration, he denied all allegations of ethical misconduct. President Trump said he is a good man who Democrats were trying to destroy. 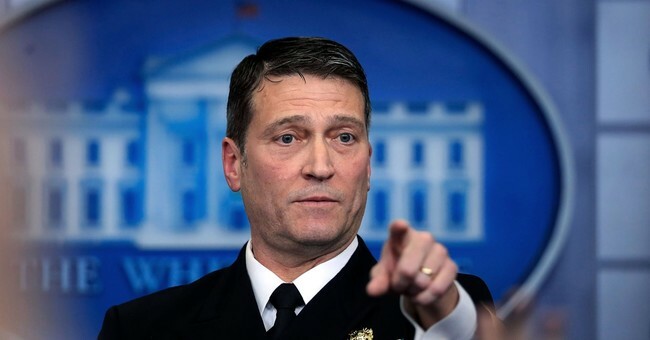 While Jackson will not become the next VA secretary, he will continue his service as President Trump's physician.